AFRICA/ZIMBAMBWE - Social tension, the Bishop of Harare: "A truce and to work together for the common good are urgently needed"
Harare (Agenzia Fides) - "A truce is urgently needed. We need a mature political leadership, which recognizes the need to work together for the common good", said the Archbishop of Harare, Robert Ndlovu, after reporting the multiple deaths registered during the violent protests, following the increase of the fuel price. As learned by Fides, the Church asks to return to follow peaceful roads of confrontation, even in the externalization of dissent. Last January 14, three people died, including a police officer, as well as hundreds of injured, due to violent protests that arose after President Emmerson Mnangagwa's announcement of an increase of more than 150% of the fuel price (see Fides, 17/1/2019). "It is difficult to obtain a complete picture of what is happening - notes Mgr. Ndlovu in a message sent to Fides - because Internet connections are still inactive and many people have not yet been able to get back to work". Internet services were cut on January 15 when the South African mobile networks forced it to close. As confirmed to Fides, Catholic schools in Harare have been closed, along with most of the other schools in the country: "Parents fear for the safety of their children", said the Archbishop. 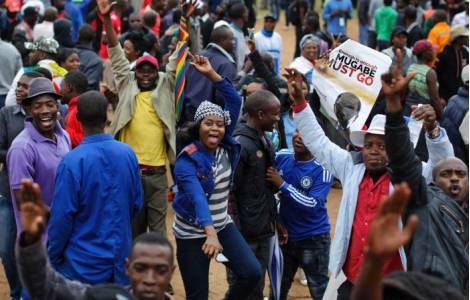 According to information reported by the organization Human Rights Watch, protesters burned a police station, barricaded streets and looted shops in Harare and Bulawayo, the second largest city in Zimbabwe. The security forces responded with guns and tear gas. Amnesty International condemned military repression and claimed that the police forced hundreds of people out of their homes with violence.